First Team, Second Team and Third Team All-American Listings for 2009 complete with comparative stats for every position. The first glimpse at Heisman voter Todd Helmick's compilation containing the Top 25 candidates. The famous NationalChamps.net TV Listings. A week-by-week 2009 college football television schedule with top games to watch highlighted. Welcome to the NationalChamps.net 2009 College Football Preview. This year we have decided to make the entire preview FREE! The presentations will be different this season as we start with team # 50 and work our way up to # 1. In addition, other teams outside the rankings will be released periodically. So bookmark our page and come back periodically to check on teams being added. This is our 10th anniversary of producing online previews. We hope you enjoy our annual presentation. NationalChamps.net takes pride in archiving all of the information from years gone by. Take a stroll down memory lane and peruse some of our college football previews of the past. Want to see what our Top 25 looked like back in December? Take a look at the Early Bird Preview, complete with depth charts and rankings. 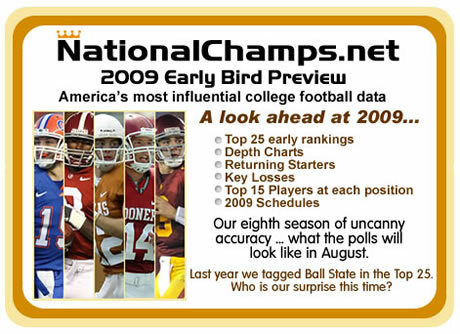 NOTES: NationalChamps.net is proud to present the 2009 College Football Preview. As information changes so will the previews. All digital photos are by strict release of each individual school's Sports Information Department. Any duplication or use of each photo is strictly prohibited. © 2009 NationalChamps.net, LLC. All rights reserved.